Bangkok bicycle tours can be great fun! It’s not the first thing that comes to mind when you think of Bangkok. In fact, if you have ever experienced traffic in Bangkok, you might think that only suicidal people can be insane enough to move through it with a meek bicycle. But there actually are awesome places to go by bike, and experience the city in a very different way. There are many local communities that can easily and comfortably be explored by bicycle. There are now many tour companies that offer Bangkok bicycle tours – but some of them just give you a bicycle and a “tour guide” who will drive with you along the way, without actually explaining anything. We have tried several of them, and in some cases it is almost ironical when people ask the guide a question, and the guide just answers: “I don’t know” all the time. In one case, a woman was taking interest in one building, and she asked the guide: “What’s that building?” And he answered: “It’s an old building” (which was obvious in the first place, and probably one of the reasons why she inquired about it). Also, there are very different quality standards when it comes to bicycles. Some will give you a really state-of-the art modern and safe bike – while others will give you a bicycle that is old and worn out, and might even have issues with the breaks. If you want to strike out on your own – you can also rent a bicycle in some places, and usually they are maintained quiet well. You have different options of what to do and where to go. There are some really green areas of Bangkok where you can see the khlongs (small waterways) with lots of tropical trees and plants, banana plantations and a laid-back style of living. Then there are areas in the vicinity of Chinatown that are interesting to visit by bike, and get impressions from a unique subculture in Bangkok that has maintained their traditional style of living. 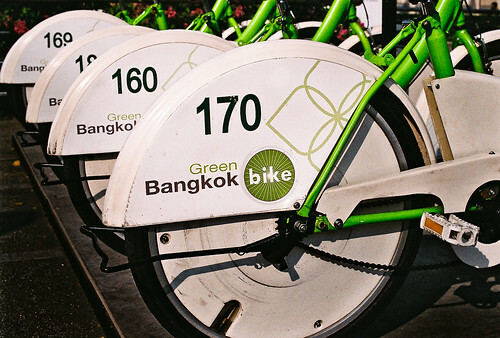 Whatever your Bangkok bicycle tour of choice – be free to contact us. We can help organize a already-made trip for you, or custom-create one that fits your interests and needs.